Brisbane’s northern feeder bus services are being revamped in the wake of the impending completion and opening of the Northern Busway’s second stage on June 18. An extra $10 million has been thrown on top of the $444 million infrastructure project to provide more than 2000 weekly bus trips through the busway. Transport and Main Roads Minister Scott Emerson says TransLink’s Northern Busway package, to be delivered by Brisbane City Council, will include two additional high frequency routes and several new routes. At June’s opening of the busway, peak hour buses will operate every two to three minutes between Chermside and Brisbane CBD. Also opening on June 18 are two new state-of-the-art busway stations at Lutwyche and Kedron Brook. A spokesman for the Minister says a public open day is being considered leading up to the opening, with details likely to be released next week. Currently, accredited bus operators who will use the busway are receiving driver training. This second section of busway opening on June 18, from Federation Street at Windsor to Truro Street at Kedron Brook includes three tunnels. The second stage joins the existing Northern Busway Stage One, already in operation and running from the Royal Brisbane Hospital at Herston to Federation Street, Windsor. - Upgrades to routes 330 and 340 providing combined frequency of routes 330, 331, 332, 333, 340 and 341, delivering a bus every two to three minutes during peak periods and every five minutes off-peak, for passengers between Chermside and Brisbane city. - Route 330 from Bracken Ridge and route 340 from Carseldine are both being upgraded to high frequency services, delivering a bus at least every 15 minutes off peak. - Route 369, a new high frequency cross-town service from Mitchelton to DFO Airport via Brookside, Stafford Road, Kedron Brook, Toombul and East-West Arterial. - Extension of route 335, Taigum to the city, with buses now running to Sandgate and providing a direct service between Sandgate and Chermside. - A new route 329 bus will service Lacey Road, Bracken Ridge for the first time, taking passengers to Carseldine train station for connections into the city. "The Lacey Road service and the Sandgate-to-Chermside connection were the two most frequently requested additions to northern buses during feedback to TransLink," Emerson says. "This is a seven-day service, running every 15 minutes, replacing the less frequent routes that currently operate across the Northern suburbs," he says. Emerson says the package of new bus services means a bus will pass the Northern Busway’s Kedron Brook and Lutwyche bus stations every three minutes during peak, and every seven to eight minutes off-peak. 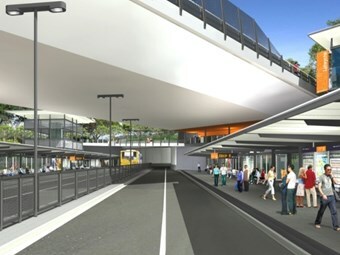 The Transport Minister’s spokesman could not confirm an expected construction start date of a third stage of the Brisbane busway, proposed by the previous Labor Government to extend from Kedron Brook to Chermside.